This is the first Cotton Cordurouy Newsboy Cap Hat People has offered online. Cordurouy is very popular at Artisan Markets & Festivals we attend, but my sources are limited in the amount of yardage they can supply (I am very particular about cordurouy), so I have resisted putting corduroy online until now. This corduroy is a rich dark brown with some black. Although we preshrink all of our cottons before we make your hat, we strongly recommend that you wash your cotton hats in cold water and allow them to air dry. Small changes in size, due to hot water wash, can effect the fit of your hat. Sizes are listed in inches of circumference and instructions describing how to measure your head can be found on our Ordering Information page. In brief, we recommend using a cloth measuring tape to determine the circumference of your head. Hat People makes four different cuts in the Newsboy style. To view the difference between the Medium, Deep, Full & Extra Full Cuts please visit our Touring Cap Cuts page. 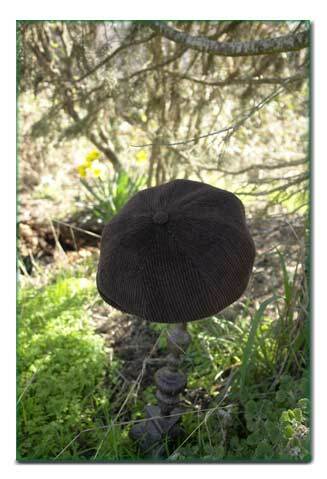 Special orders can be arranged by email or by calling Hat People at (888) 930-4287. We have many more fabrics in our studio than can be shown on the web, so if you have something in mind that you don't see here, please feel free to contact us directly. If we can pull the your special hat from stock, there is no additional charge. Postage within the USA by priority mail is included in the price of the hat!